Lock in a great price for Vila Bled – rated 9 by recent guests! A feeling of opulence, with mid-century modernism, without being overbearing - the view is second to none. The food was absolutely outstanding. Elegant huge suite. Excellent restaurant with outstanding chef. Best hotel on our 8 day European vacation. 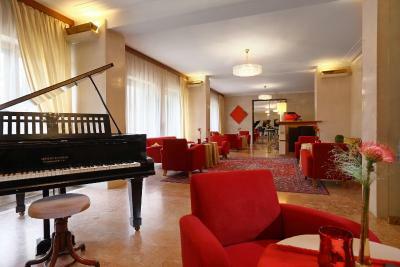 Very classy hotel that brings back the old elegance and luxury. Magnificent location - isolated but still close to the city center. A breathtaking view from hotel room overlooking a fairy tale like garden. Spacious room. Awesome breakfast! Professional staff. Excellent for relaxation because of its location on the lake shore and private garden; you can watch squirrels play around the lawn! Property was beautiful. Room was huge. Amazing view from room. Loved the row boat rental that was included in stay. Staff was lovely. Food was great. Very spacious room(s). Really, too much room if that's possible. Decent restaurant with interesting menu. Comfortable bed and very spacious bathroom (a plus). View of the lake was outstanding and the photos, art work, and murals were very interesting. Parking was a real plus … just a few meters from the entrance. The property is beautiful on the outside and we were upgraded to a beautiful corner room on the top floor with a gorgeous view of the lake, the island, and the castle. The room was so spacious with an entry way, a good size bathroom, a big living area, and a big bedroom all separated by doors. Very quiet. Amazing location on the lake, and away from the main road, absolutely quiet. Very unique for the touristy area around Bled. Large and comfortable room. Amazing view to the island and the castle. Very good breakfast. Vila Bled This rating is a reflection of how the property compares to the industry standard when it comes to price, facilities and services available. It's based on a self-evaluation by the property. Use this rating to help choose your stay! One of our best sellers in Bled! 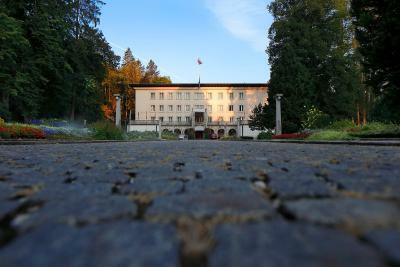 Located on the shores of Lake Bled and surrounded by a beautiful park, Vila Bled is President Tito’s former summer residence. It features a luxury spa and offers free Wi-Fi. The spacious rooms all feature cable TV, a mini-bar, and a large bathroom with bathrobes and hairdryer. Vila Bled’s restaurant serves Slovenian and international gourmet cuisine. In summer, guests can enjoy the private swimming deck with a boathouse. 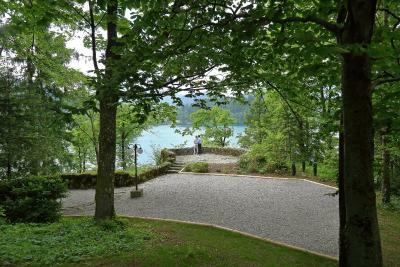 Free private parking is available at Vila Bled. When would you like to stay at Vila Bled? This room features cable TV, a safe and a mini-bar. Some rooms feature a balcony and they are available upon request. This suite features cable TV, a safe and a mini-bar. This room features cable TV, a safe and a mini-bar. The charming Vila Bled, a former presidential residence, lies in a peaceful part of Bled, the pearl of the Slovenian Alps. 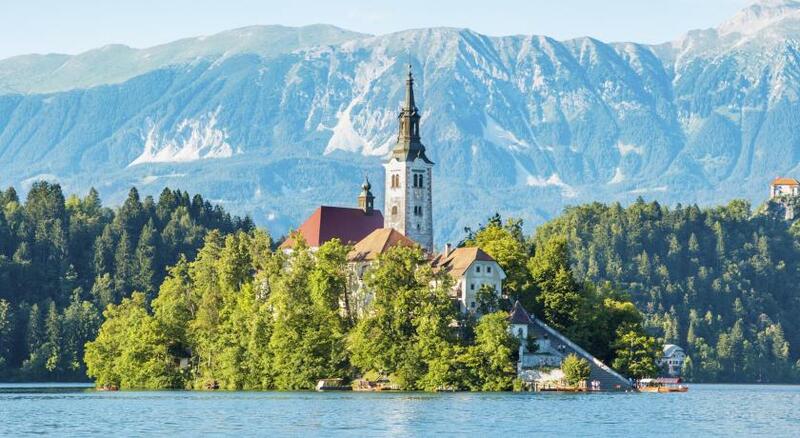 Surrounded by a magnificent park that leads down to the very shores of Lake Bled, it offers an exquisite experience of the fairy tale natural setting. Warm hospitality, refined comfort, timeless elegance, delightful cuisine and precious moments have all found a home in the Vila Bled. Loyal to its architectural layout and rich history, the Vila Bled offers a varied palette of rooms and suites, elegantly furnished in a style reminiscent of the 1950’s. The building was completed in 1947, and served as the summer residence of President Tito for many years, where he hosted numerous official state visits. Tito welcomed many eminent dignitaries to the villa, including Ethiopian emperor Haile Selassie, leader of the Soviet Union Nikita Khrushchev, King Hussein of Jordan, Indian Prime Minister Jawaharlal Nehru, his daughter and Indian Prime Minister Indira Gandhi, Egyptian President Gamal Abdel Nasser, Prime Minister of Sri Lanka Sirimavo Bandaranaike, Indonesian President Sukarno, President of Zambia Kenneth Kaunda and many others. House Rules Vila Bled takes special requests – add in the next step! Vila Bled accepts these cards and reserves the right to temporarily hold an amount prior to arrival. Everything, most importantly the view from the room. Vila Bled is an amazing hotel! We booked the suite with park view and it was super huge! The staff were super helpful and immediately checked us in and answered all of our question. The room is exceptionally clean and organised. We also had breakfast and dinner there and both were amazing. The dining room overlooks amazing view and the quality of service is impeccable !! The parking is for free as well and right in front of the hotel which is a huge plus. Everything.. it was a pleasure. Property is a reasonable walk from the main town. This is goos for aeclusion and nice when there's good weather but not so good for going out for dinner in the rain! Wonderful location with lovely views over Lake Bled. Very peaceful at this time of the year. We enjoy our few days at Vila Bled each year in the early spring. No comfort in the room just a bed no cushions on the sofa no waste bin no writing paper or pen . The Bar was shut only opened when asked ,no body dining in the evening except us .Poor lighting . It all felt very Spartan not at all luxurious. However the Staff were very pleasant . Great location with a wonderful view. What an amazing location. The view of villa bled Church even from the bathroom! The very special location, comfort,elegance and atmosphere of particular, old style.Best views ,great park and good services. Free,easy parking.Thanks for reserve the suite at the superior floor as I asked by Booking . the rooms are lovely but a little old fashioned in their layout. 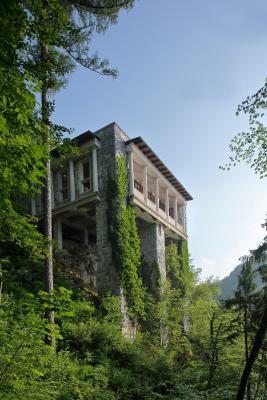 Lovely villa right on the shores of Lake Bled. A bit out of town, which is good because you get a scenic walk every time you go out the door!